We have an area of our yard at the bottom of a small slope. It tends to stay damp to wet. It’s also clay. What tree would you recommend for that area? Well the 1st thing I did was check what plant hardiness zone Aubrey was in. It is zone 5b which means their winters can be expected to get down to -10 to -15 degrees range (F). I also know that in Denver, it is usually not enough water that is the problem. So her situation is an example where the specific site (wet) is different than you would expect in the general area (dry). Since most evergreen trees do NOT like wet poorly drained soil, the list of evergreens is small. So lets get it out of the way. I have not included some trees like the Eastern Arborvitae (Thuja occidentalis) that take occasionally flooded soil, but won’t take constantly wet soil. All these evergreens like sun. 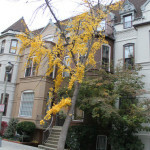 Deciduous trees (trees that drop their leaves in the Fall) offer more choices for wet areas. When choosing among these trees, to help narrow down your choice, you should consider the soil pH. I have broken the following trees into what soil pH they like. Most trees prefer a more acidic soil, so you if you have a neutral or acidic soil you could also choose one from the list of trees for alkaline soils also. Aubrey should probably look at the 1st list, those that tolerate higher pH soils. These two trees are among those that do the best in wet soils. They are also unique in that they are deciduous conifers that make great landscape trees. They are the Bald Cypress and the Dawn Redwood. Think this Bald Cypress can take wet soil? 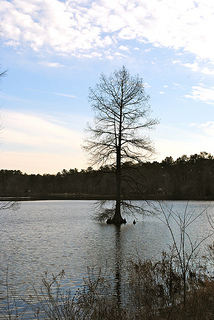 The Bald Cypress (Taxodium distichum) is probably one of the best trees for wet areas. It grows in zones 4 to 11 and can tolerate dry soils as well as constantly flooded areas. It grows pretty tall and can reach 50-70′ tall and 20-30′ wide. The only thing this SUPERTREE can’t do is keep it’s needles in the winter. Plant this tree and get ready to hear your neighbors say your pine tree is dying. It is a conifer, and looks like an evergreen. It however loses it’s “needles” every year in the fall shortly after they turn an attractive russet color. 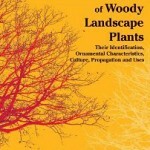 If you soil is really wet and want a large shade tree, this should be the 1st one to consider. Plant a Dawn Redwood and you get to tell a cool story that makes you look smart! Being one of the few conifers to lose its leaves (needles), the Dawn redwood, is an odd tree, which also has an odd story. 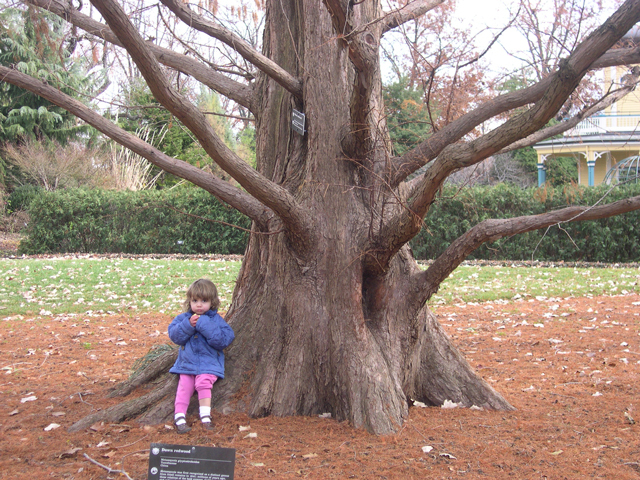 Several million years ago, the Dawn Redwood thrived around the world including North America. Their presence is proven by the fossil record. In the early 1940s, a Japanese botanist first described the fossil of this unique tree. 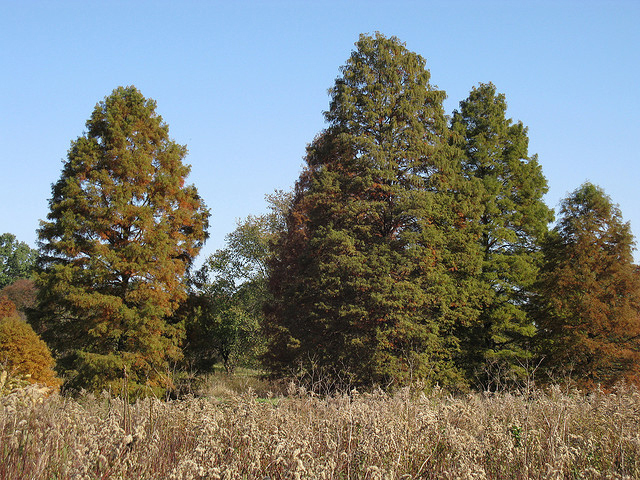 Close by and soon after, a Chinese forester discovered a deciduous conifer he thought to be a Chinese swamp cypress. He collected some samples and later passed them on to the National Central University. These samples made their way into the hands of a scientist, who determined it was not a swamp cypress at all, and was in fact was a new type of tree. New specimens were collected, and eventually were matched to the recently described fossils. Seeds of the new tree were sent around the world. You can now buy these trees ancient trees at your local nursery. But be warned the ones planted in the 1950’s are still growing and several have past 100 feet. Unless you have acreage, a dwarf slower growing cultivar such as ‘Ogon’ may be a better choice. 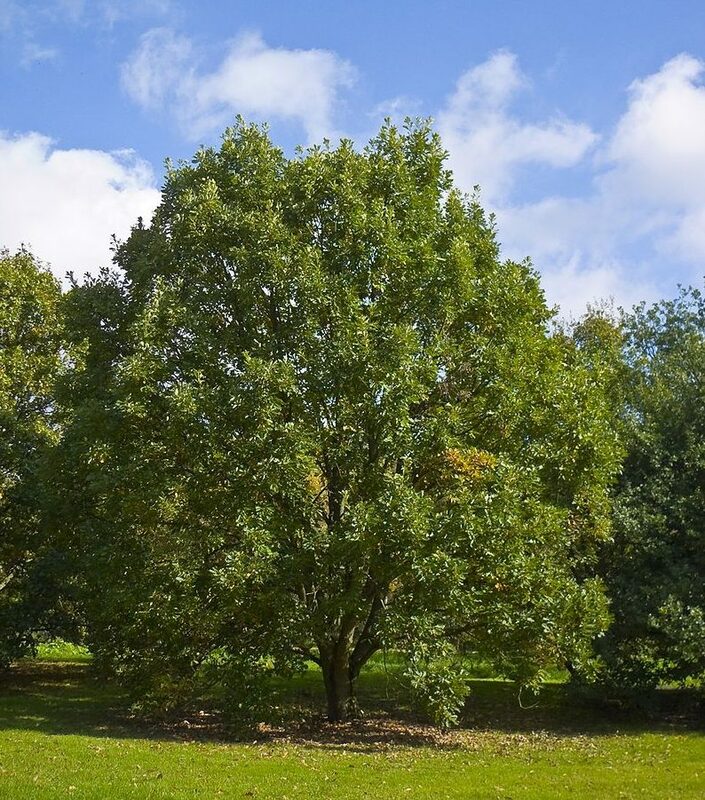 If you prefer a tree that does more for the environment (and I mean A LOT MORE) than the Dawn Redwood, you should take a good look at Swamp White Oak (Quercus bicolor). Yes, it takes wet sites, I mean its common name has the word “swamp” in it. It is a fantastic shade tree for lots of sites besides wet ones too including dry ones. It does not like alkaline soil, however. Not only is it very adaptable, but it is also a fantastic tree for the environment especially if you live in one of the states where it is native which includes the Midwest to the East Coast. If you are in the South, Bald Cypress would be better. See my post on Selecting trees for carbon sequestration and wildlife support for more information on this great tree. Swamp White Oak transplants well (a problem for many oaks), grows fast (especially for an oak) and supports tons of wildlife biodiversity in its large native range. This list of trees is some of the most tolerant of wet soil. There are others that I left out such as the common alder that I just don’t like as they are weedy that you may want to look into. Note I revised the original post on 12/3/18. Chris, what type of limber pine do you have is it just the species or is it a cultivar like ‘Vanderworf’s Pyramid’? The reason I ask is I usually see Vanderwolf’s Pyramid being the one most seen in the trade. If it is that one, it may just need to be established another year or two before it starts growing faster. Once those get growing they can put on two feet a year in my area where a Dawn redwood may be a little faster, but not much. If they are regular Limber pines than yes they will be much slower than the Dawn Redwood. As far as other fast growing trees that can keep up with the Metasequoia, I would not plan on a Beech for sure, the River Birch may not be a bad bet. Dura Heat and Heritage are two good ones that get big quick. I almost hate to mention it as it is way over planted these days, but Freeman maple ‘Autumn Blaze’ is another fast growing tree. Another real fast growing tree that get REAL big is the Tulip tree (Liriodendron tulipifera). White pine and ‘Green Giant’ arborvitae (Thuja ‘Green Giant’) are a couple of fast growing evergreen trees. You could also plant another Dawn redwood, although that would not diversify your yard. The new disease resistant elms are a great choice as well. Go to central Texas and you will see that bald cypress are thriving in alkaline soil (limestone bedrock along the rivers). Montezuma cypress will also do well and also faster grower and more evergreen as well. Both are less likely to form knees. I am looking to build some shade/privacy in our backyard. I live in zone 6 in Michigan. The backyard gets a lot of sun, however it is on the edge of a wetland, so the soil is pretty moist. I am looking for a tree that is coniferous and will grow at a medium speed with a good spread. I have heard that spruces have been hard to maintain secondary to disease, so I have been looking at a lot of the fir’s. Any help would be appreciated. Thanks. If your soil is wet, forget firs they will die almost immediately. Hi, my name is Brian, I live in Crystal Lake, IL. I love to do my own landscaping. The S.E. corner of my yard is very wet and holds water, I bought a Dawn Redwood at a local nursery last October and planted it. I’m impressed on the growth in just 7 mos. 2′ . What is another tree or trees that would compliment this beutiful specimen? I look forward to your answer. Depends on the size you are looking for. 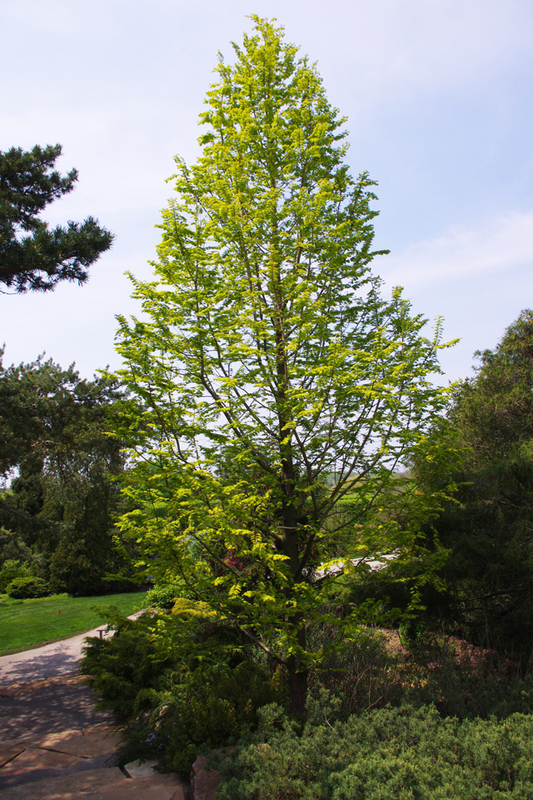 A similar tree that would be a little different would be a Bald Cypress. Hello Jim. Thank you for creating this website. I found it very helpful, but have a question. How does the Norway Spruce (Picea Abies) compare to the White Spruce (Picea Glauca) in terms of water tolerance? I am considering planting two or three Norway Spruces or White spruces in an area that killed 3 Douglas Fir trees due to root rot. I live in the pacific northwest (Victoria, British Columbia) and beleive I am in zone 8. Two years ago I levelled out my backyard and put up a rock retaining wall on 2 sides. The tallest section of the wall is 3′ on one side and 1′ on the other. This is the corner where I want to plant tall evergreens. Needless to say, my property is on the bottom of the wall, that is, the levelling of the yard removed soil, not added it. There is only a very gradual slope, perhaps 1-2 degrees. which slops away from the 3′ rock wall. About 4′ from the rockwall is where I had planted the 3 Douglas Fir trees. They were 15-20′ transplants. They were planted in Dec. 2014. By April 2015, 2 were dead. Root rot. The 3rd one survived and grew well during the summer of 2015. Now, it is April 2016 and the 3rd Douglas Fir died. The roots were stained black (Black-stain root rot?). I have clay-based soil, but the top 6″ is lawn mix, or potting-type soil. The area around the Douglas firs had grass to help drink some of the water. I left 2′ diameter dirt area around the firs with no grass. Since this area of the yard has been levelled down, the water table is altered up. In this area, I need to grow some tall evergreens to a) block the view of a tall building behind the house and b) block out a tall high voltage transmission tower. I have been doing a lot of research as to which evergreens might tolerate wetter soil (compared to a Doug Fir). I have been considering Norway Spruce, Sitka Spruce, Engelmann Spruce, Black Spruce, Western white pine (Pinus monticola), Red Cedar Excelsa (Thuja Plicata Excelsa), Western Red Cedar (Thuja Plicata), and Leyland Cypress. Some firs which are more tolerant of water compared to a Doug Fir that came up in my research were the Pacific Silver Fir (abies amabilis), Balsam Fir (Abies Balsamea), and Grand Fir (Abies Grandis), however I think it best to rule out the firs. Number 1 at my list is the Norway Spruce, but I am having some difficulty finding it in my area. I also was not sure how the Norway Spruce compares to the White Spruce (Picea Glauca) in terms of high water tables and soggy soil. I originally was considering the Western Red Cedar, but the trunk flare of this tree is quite large and it will eventually destroy the rock wall. For this reason, I was thinking the Red Cedar Excelsa might be more appropriate. However, we already have 80 Emerald Cedars elsewhere on the property lines and would like some change, which brings me back to the White Spruce. I really like the look of giant spruce and fir trees. The Black Spruce, while it seems to tolerate water well, was mentioned to be slow growing. While the Sitka Spruce grows native on Vancouver Island, I was hoping for a tree with less sharp needles (e.g. firs and Norway Spruce). Based on some online reading, it seems that the Norway Spruce grows faster than the White Spruce, which makes it more attractive. I am hoping for 70′ trees in 25 years. I have a 20′ section of perimeter I’d like these to cover and was thinking 2 Norway Spruces, or 3 White Spruces. The British Columbia forestry website only has listings for native trees, but it mentions that the white spruce has a high tolerance for water surplus and is frequently found on water logged sites, but less tolerant of prolonged flooding. For the Sitka Spruce, it mentions that “grows on waterlogged sites and floodplains; tolerant of prolonged flooding and strongly fluctuating water table”. Based on this information, it seems like the Sitka Spruce is more resistant to water, but as the Norway Spruce is not native to British Columbia, I cannot determine its comparitive water tolerance. A general note – the soil is wet, but there is never any standing water above ground. The area has never flooded. I do not sink into the grass at all, but there are some winter soggy spots, but not right at the tree trunks. This area of the yard has grass the grows the fastest and stays the greenest longest due to the high water content. Another question I have is what should I treat the soil with – that is, the soil that remains after I removed the rotten Douglas Fir? I have pulled out as many of the black stained roots as I could find, but there will always be some small ones remaining. I have read that some people use hydrogen peroxide or something called “Hollytone”. Is there anything else I should try to treat this clay soil with? Simple compost mixed in? Root growing hormones like high phoshate fertilizers? I have read that some pople use “Great white”, “mykos”, or “SubcultureB”, however I have not had any experience using these. Sorry for the wall of words. Any advice is much appreciated! I think that white or black spruce will be much more tolerant of water logged soil than Norway spruce. As far as treating the soil, you should take the roots and a soil sample to a pathology lab to get their diagnosis and recommendations for tolerant trees and soil treatments / additives. 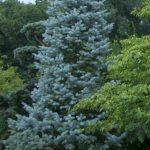 Unfortunately, I have been unable to find White Spruce, Black Spruce, or Norway Spruce at any garden centre, nursery, or wholesale nursery on Vancouver Island. Everybody only sells the smaller garden variety cultivars, which I do not want. I can obtain a Sitka Spruce, but the needles are sharp like injection needles, and I’m afraid my little kids will hurt themselves. I read some articles about the Douglas Fir and black-stain root disease and I am fairly confident this is the offending fungus. Based on information provided by the government of BC, I am considering the GrandFir, which is “frequently found on floodplains and areas with a strongly fluctuating water table”; and the Western White Pine, which “tolerates wet sits and water inundation.” I may also just try my luck with Leyland Cypress or Murray Cypress just because they are available. On line nurserys or your local state cooperative extension services or conservation dept. can help you. Jim, we live in Orlando, FL and planted a Eleocarpus, Japanese Blueberry, in the backyard. It died within two months. The nursery we purchased it from said that the soil was two wet and would not recommend putting another one back there. Is there another canopy tree you could recommend for this zone for wet soil conditions? Florida has a whole different plant palette then us her in Chicago. I would go to a long established independent nursery and ask their advice. Hey Mick, I doubt the tree died from too much water. If your soil is sand which I imagine in central Florida it’s almost impossible to overwater. Unless your builder used a crap fill clay soil as they did in my new development near Bradenton Fl. Thanks. Florida is just a bit different then Chicago. They also mention an idea of putting gypsite atop poorly drained soils to improve drainage over a 3-year period. I live in western new york south of Buffalo and have wetlands in my back yard. Would a Dawn Redwood work? Any other suggestions… My goal is to Beatify the yard and dry it out a bit. Yep, they should. Bald cypress is another good one. Avoid weeping willows please. I would look into wetland plants in your area that you could use. There are tons of beautiful wetland shrubs and perennials. I live in Green Bay, Wi. on a golf course adjacent to an area designated as ‘wet lands’. I would like to plant evergreen trees in a swampy area that is adjacent to the fairway on the golf course to camouflage a road that runs behind. I found some White Pine that are 10′ tall and beautiful. Would they survive in these conditions? If you would dig one shovel-full you would hit water. Absolutely NOT. They will die within a year. White pines do NOT tolerate wet conditions. We live in Denver, CO & looking for a sun-loving AND water-loving evergreen. The area it will be planted in is consistently moist & often swampy even with a french drain underneath. We have tried several trees which have died. Should we try & find a white cedar or white spruce? 1) Could that 4 days caused this stress? 2) I’ve read on internet that you can’t over water, but also they are drought tolerant and you CAN overwater…what is your opinion? 3) Would a shot of seaweed or fish emulsion be advised? Thank you so much for taking time to respond. These are my babies! First off, let me say may experience is limited to the Midwest. I have been to Texas, but never grown anything there. I also don’t know this particular tree although it does look pretty cool. I do like it’s relative the Bald cypress quite a bit. So anything I say is from my generalized experience. Unless it was extremely hot the 4 days your were gone, it sounded like you did everything right. You can probably over water them but it does not sound like you have. Some plants will drop some leaves in mid to late summer as a response to higher temperatures. River birch is a classic example in my area. It is possible that this is what is occurring with your trees. I would say proceed as you are. 1) Yes, but probably not. 2) You can over water them but it does not sound like you have given your climate. Most people UNDER water not over water (especially 1st year plantings). 3) If it will make you feel better. The tree probably won’t care either way. I live east of Austin, Tx. I am looking to replace a few trees that blew over in my backyard. I think they are Leyland cypress. We live in a windy area, and each year a tree falls over. We have a small backyard, and what I feel is the worst of all categories. The soil is heavy clay and rock. You know, the garbage they use to backfill properties when building new housing developments. It is also on a decent slope. Our whole backyard slopes down to the fence, which is where the trees are. In between each cypress is a Japanese cedar. Since they don’t grow near as fast as the cypress, they are still standing, nor are they leaning like the remaining cypress. We plan to cut down the remaining cypress which are all leaning into the fence. I’m not sure why they blew over, but my guess is that their roots couldn’t go deep enough because of all the huge rocks in the ground. Any evergreen trees you can recommend that can withstand the heavy clay/rock soil as well as the wind? Looking for something with max height of 30-50 feet tall, and not terribly wide either as they are between the fence and a retaining wall (~10′ wide). I’m fine with pruning if needed. I don’t want more of the Japanese cedar because they’re kind of ugly. I had found online that eastern red cedar do well in windy locations, but I’m not sure about the soil conditions. I live in SW Washington in zone 8. Any advice would be greatly appreciated. Thanks! You are really in a totally different climate than me here in Chicago. That being said, lots of evergreens have this problem. There are some nice cultivars of eastern red cedar although they may be hard to find. 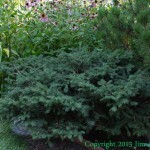 They take tough rocky and clay soil as well as any other comparable evergreen you will find. May be a good choice if you like how they look. They don’t take wet soils though. It does not sound like those are your conditions. Thanks for your response. As far as being wet, I guess it depends on the season. We do get a lot of rain, so in the winter/spring, the soil will be quite wet since clay doesn’t drain very well. But since it is on a slope, the trees are not in standing water. However, in the summer it will be very dry. Our sprinklers don’t reach the tree line so they won’t get watered during the hot weather. Will the water retention of the clay soil in the rainy season be considered too wet for an eastern red cedar? Thanks. Jim, last year TVA came through and cut down all my 80-100 year old shingle oaks, red and white oaks along my property line. So now my view is TVA’s 100’+ tall power transmission line tower. My former trees vertually obscured the TVA tower. I need help selected fast growing tall trees for a 7a zone that I can plant just outside the TVA ROW, I have an east/west trending 50′ wide area from the edge of the TVA line to the edge of my pool deck. in the center of this path is the low area of my yard (old headwaters of an intermittent stream now established in turf), area remains wet to soggy 2-3 months a year and has 3″-6″ of flow during storm events. Top soil is thin 4″ to 10″ grading into B horizon soils (clayey silts). With that said, I like bald cypress’s and river birch and I’d like your opinion on planting Dawn Redwoods in the zone. The wet soggy areas have pH’s ranging from 5.5 to 6.2 and the higher areas average 6.5 to 7.0 pH. Wet zone is approximately 10′ wide and has a 1-3′ rise on either side and a drop of approximately 7′ over 220′ from east to west. Will the Dawn Redwoods work in this area? Thinking cluster of 3 on 25′ centers, complimented with several Bald Cypress on the downgradient side and River Birch on the upgradient side (east). Presently the whole yard is full sun. Any thoughts, or words of wisdom? Sounds like a sound plan. I am not sure how resistant to wind Dawn Redwoods are. I live in Southeast Ohio. My property is bisected by a creek. Problem is I have an area on the side that stays wet and I mean standing water. It is very close to the creek, but also not far from my house maybe 50 ft, on same side as my Septic tank and within 60 or 70ft of my leach field edge. I’m in Appalachia so soil here tends to be clay and lots of shale so not much drainage. I would like to plant something that would help dry up the standing water but also not seek out or damage my Septic system with it’s roots. Any ideas? I live in southeast wi. I have 40 acres of wetlands that is usually wet from nov thru june. I have planted American tamarack and they are doing good. My question is would white spruce be able to tolerate that same soil. I kinda would like to put up a wind break to the west. Black spruce would do better. Jason, it would be interesting if someone in your situation planted a variety and wrote-up a case study, e.g. planted 6 American Tamarack, 6 White Spruce, 6 Black Spruce, 6 Norway Spruce, and, maybe, 6 Sitka Spruce and 6 Grand Firs. They would need to be planted until very similar soil conditions, moisture, and sun exposure. Then over the course of the next two decades, document their growth. The Norway Spruce I planted in my soggy region are still alive, but there hasn’t been sufficient time to draw any conclusions. I do have some white, black spruces that I am growing in pots just in case. When I was speaking with the owner of one wholesale nursery in town, he mentioned that the black spruces prefer the extreme cold in the winter to allow their roots to go deeper into hibernation. The roots are less susceptible to winter rot when they are in hibernation. He was saying this is why Black Spruces do so well in places like northern British Columbia and Alberta – because of the extreme cold. Anyway, don’t take my word for it, this is just what some old timer running a nursery told me. I live on southern Vancouver Island and do not get such extreme colds. I have seen a lot of Norway Spruces planted around town and only one White Spruce thus far. No Black’s except for what are in my pots. The nursery owner also mentioned that Norway Spruces are easy to domesticate. Munster, Indiana. The soil in my back yard is primarily clay and does not drain well. I have a row of arborvitaes that are doing well. I have had to replace a few. I have a red maple tree that is not doing well. This spring there are hardly in leaves. Other trees in the neighborhood are thriving. I want to plant a tree that will do well in this wet area. I am thinking of a pine oak, cypress, or river birch. The goal is to have a larger tree that provides security from other yards. Do you know how a Bruns Serbian Spruce would do in wet, clay, poorly drained soil?